Anyone who bought a painting by Daniel Boyd (via the Ros Oxley9 Gallery) will have had their taste and wisdom confirmed by this week's announcement that he's taken out the third Bulgari Art Award worth $80,000, and delivered his stunning painting, 'Untitled' 2014 into the AGNSW's permanent collection. 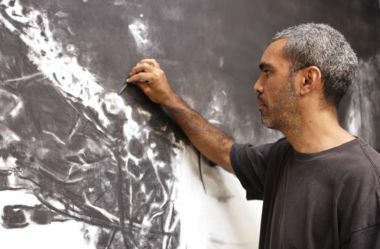 Boyd – just 31 and not quite as old as the other 'mid-career' artists, Jon Cattapan and Michael Zavros who preceded him in winning the Bulgari – is a Kudjla/Gangalu man from North Queensland whose recent art has concentrated more on his Vanuatu ancestry. His Great-great Grandfather was black-birded from his Pentecost Island home in the 19th Century to work as a slave in the Queensland sugar plantations. 2013 was the 150th anniversary of this practice's commencement. 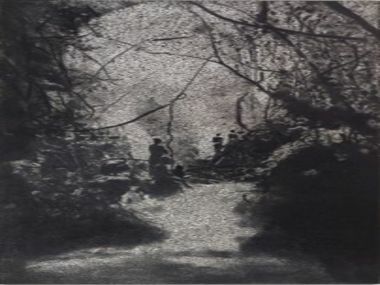 And Boyd's winning work is based on an archival photo of women at an extraordinarily peaceful island waterfall, helping the artist to both come to terms with his ancestral landscape and to make an ironic point about Australia's brutal aggression in its unappealing past. So, how 'Aboriginal' is the work and the artist? “I can't avoid painting as an Aboriginal person”, Boyd explained simply at the Art Gallery of NSW, whose curators in conjunction with the Gallery's trustees and the Italian jewellers, Bulgari chose the artist to win. He (or she) then paints a work to go into the Gallery's collection – receiving $50,000 – and also gets $30,000 to visit Italy. There Boyd expects to meet the craftsmen who create Bulgari's premium jewellery; he also intends to examine aspects of the Enlightenment in Italy – the era which informed European colonialism, including its cognisance of slavery. Oddly, the Gallery sees Boyd's black and white works – a series he's been working on since 2009 – as using “dotting reminiscent of various historical and recent sources in both western and Aboriginal art”. I'm not sure the artist is appropriating desert dotting, though, with his use of a glue stick to create a mottled surface to his reconstructions of photos. In an animation in the most recent Asia Pacific Triennial, the dots referenced the stars that were so important to both his island ancestors and to Captain Cook's voyaging. They must also reference the pixels in photography - “a lens through which the world is both viewed and distorted. It's a kind of erasure of memory or history,” he says in the APT catalogue, “relating to the process that governments used through Australian history disregarding Aboriginal culture and systematically taking their culture away from them”. Interesting use of “they” and “them”. Closely involved in proceedings was Julie Ann Morrison, who uniquely holds the jobs of Managing Director of Bulgari in both Australia and the UK. She added to festivities at the AGNSW by announcing that the generous Award will continue for the next three years. But don't think of applying; the selection process is totally proactive.